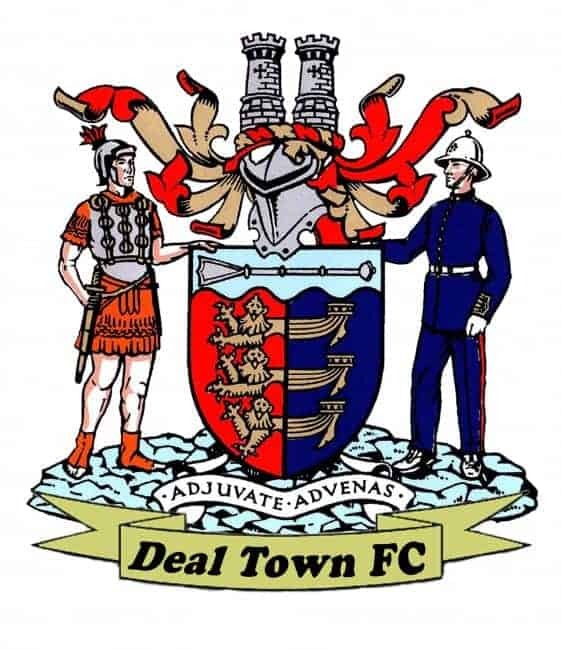 Deal suffered their third defeat in a row at the hands of Hollands & Blair on Saturday but, unlike last season’s two 3-0 reversals, the Hoops’ latest encounter with the Rochester club was a much closer affair which was only decided by an unfortunate first half penalty. Deal had Ryan Philpott back in their starting line-up following his midweek return to the club from Canterbury City, and manager Derek Hares will be looking to Philpott to improve his side’s goal output in the coming weeks. But Blair have no problems in that department thanks to the presence of James McDonald, who won the league’s “Golden Boot” award last season with a 35-goal tally. And the prolific front man struck his 17th goal of the current campaign after just four minutes of Saturday’s game, making Deal pay for allowing him too much space in the area as he fired home Gary Lockyer’s cross via the inside of a post. What followed was an entertaining end-to-end encounter in which both sides created a number of chances, although Blair’s second goal after 22 minutes was definitely surrounded by a strong piece of good fortune. When Lockyer delivered another cross unto the area Grant Bagley slipped as he was about to clear and his arm fell on top of the ball, earning Blair a penalty which their skipper Ben Brown converted. Soon after Lockyer dragged another chance wide which could have put the game beyond the Hoops’ reach, and the home side then received the lift they needed just before half-time when Connor Coyne’s persistence in chasing a long through-ball was rewarded when Blair keeper Ronan Forde blasted his attempted clearance kick straight against the Deal striker – and the ball rebounded into the visitors’ unguarded net. And, with the strong breeze blowing straight down the pitch now in the favour, it was the Hoops who were on the front foot for most of the second half. But with Luke Bigginton and Joe Anderson failing to convert close range headed chances and Bagley striking the crossbar bar with a fierce effort, Deal were unable to find the second goal they needed to avoid another Blair defeat. Hares said afterwards: “If I’m honest I don’t think there was too much between the sides. They probably had the better of the first half and I thought we had the better of the second half. “Their first goal was a bad piece of defending on our part, and although the ref probably had to give the penalty it was definitely unlucky. Then we got a bit of luck with Connor’s goal and in the second half we had the majority of the play and created two or three decent chances that we should have put away. But that’s the difference really between us and the top teams this season, we are just not taking enough of the chances that we are creating. Deal: Tonkin, Paxman, Bigginton, Bagley, Hark (Alexander 75); Hill, Anderson, Philpott, Adams, Coyne, O’Brien (Munday 67).